The first slushy mess of a winter storm on Tuesday delayed the flight of fifty endangered sea turtles from the New England Aquarium’s sea turtle hospital in Quincy, MA, to a turtle rehab facility in Florida. The recovering Kemp’s ridley sea turtles, like so many wannabe tropical vacation-bound New Englanders, found their dreams of a warm get-away delayed and then cruelly postponed by the injustice of another winter storm! 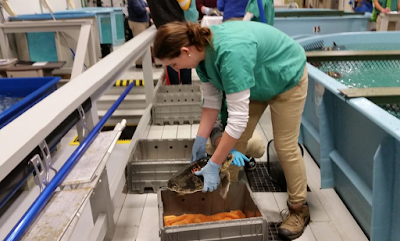 The three- to ten-pound, black-shelled, juvenile sea turtles recovering from hypothermia and other associated medical conditions appeared dejected, but kept their padded, shipping crates packed for another try Wednesday. Because of further weather delays, the journey began at Hanscomb Airport in Bedford, MA. 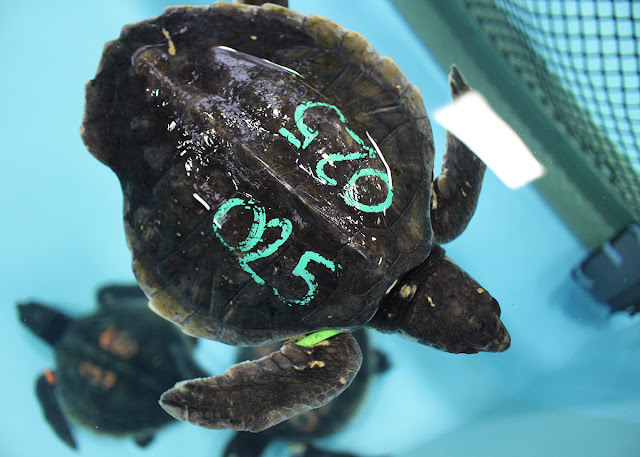 The turtles' five hour flight to Panama City, Florida, will eventually bring them to Gulf World, a marine park that has been a crucial partner with the New England Aquarium in finishing the rehab of a large number of cold-stunned sea turtles over the past two record-setting years. The flight has been arranged by NOAA and will be operated by PlaneSense, a private aviation company located in Portsmouth, N.H. They have also donated part of the cost of the trip. The remaining cost has been covered by a generous, anonymous benefactor from New York. This autumn’s sea turtle stranding season is the second largest in the quarter century partnership between the New England Aquarium and the Mass Audubon’s Wellfleet Bay Wildlife Sanctuary. 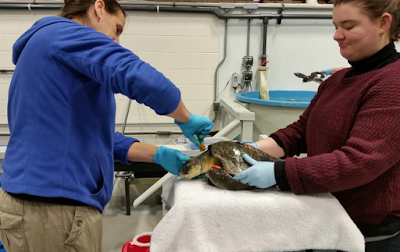 To date, 287 sea turtles that have washed up on the beaches of Cape Cod Bay have been admitted to the Aquarium’s sea turtle hospital since early November. That number is three times the recent average of about 90 treated each November and December (but pales in comparison to last year’s bizarre record-smashing total of 733). In any case, the Aquarium’s hospital is over capacity necessitating the transfer of rewarmed and medically stable turtles to other rehab facilities in the South and along the East Coast. 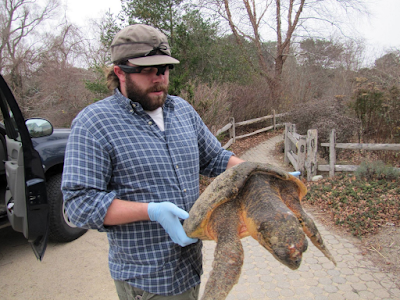 In a normal weather year, the sea turtle stranding season would already be over as they rarely survive the normally seasonable water temperatures in the low 40’s, but Cape Cod Bay has been exceptionally warm for most of December with water temperatures in the high 40’s.